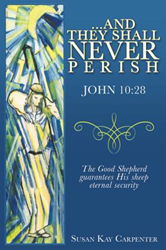 Within the pages of Susan Kay Carpenter’s new book, And They Shall Never Perish, ($17.99, paperback, 9781545605264; $8.99, e-book, 9781545605271) readers on all points of their walk with God will discover the biblical proof that their salvation is fully secured by Jesus Christ. They will learn how to let go of their fear of death and find peace, since Jesus paid for their eternal life. Both long-time believers and those just beginning (or renewing) their relationship with God will find their faith secured by the inspiring words in And They Shall Never Perish. For almost forty years, Susan Kay Carpenter has taught Sunday school and written numerous Bible studies and evangelism booklets for Jews and Gentiles. After meeting so many insecure believers at conferences and church, she was obsessed with the subject of God’s grace. She has devoted decades to the study of God’s Word. Xulon Press, a division of Salem Media Group, is the world’s largest Christian self-publisher, with more than 12,000 titles published to date. Retailers may order And They Shall Never Perish through Ingram Book Company and/or Spring Arbor Book Distributors. The book is available online through xulonpress.com/bookstore, amazon.com, and barnesandnoble.com.